With a grant from the University of California Humanities Research Institute, the Living New Deal will host a series of public conversations about the legacy of the New Deal. The five salons will be held at cultural institutions throughout California. New Deal scholars Harvey Smith, Gray Brechin, and Alex Tarr will discuss the Living New Deal’s ongoing efforts to document New Deal sites and record oral histories of those whose lives were touched by the New Deal. Please join us! Next stops… Long Beach, San Diego…. Categories: Uncategorized | Tags: Huntington, Living New Deal, New Deal, Southern California | Permalink. Your California masterpiece — published…. The purpose of the award is to recognize and promote an exciting new literary work in celebration of California’s heritage. The ideal manuscript will inform the minds and delight the imaginations of readers while generating a deeper understanding of California’s rich history. The work must adhere to high scholarly and literary standards and must be lively and engaging to general readers. In addition to conventional works of historical scholarship, other genres will be considered, such as biographies, collections of letters or essays, creative nonfiction, and other stimulating literary forms. The topic should be broad enough to be of interest to readers throughout the state. Authors with either manuscripts in progress or finished manuscripts are welcome to apply. Manuscripts, when finished, should be at least 40,000 words. While we are open to other possibilities, preference will be given to manuscripts of fewer than 75,000 words. Head to the Heyday website for information about how to apply…. Categories: Uncategorized | Tags: Book publishing, CHS, Heday | Permalink. Support Shaping and Found San Francisco!!! Many of us have found the resources on Found San Francisco to be invaluable. For a wide public, it’s an undeniable portal into understanding the urban environment. Or how many instructors have turned to Found S.F. when preparing a class? …Relied on them for photos and maps? …Sent our students on a research mission with their pages as a foundation? So many! And many others have attended incredible lectures as part of Shaping S.F.‘s marvelous programming. Countless have learned from bike tours, conversations, and books. …All of this pretty much for free—or maybe for a donation or a book purchase here or there!! But NOW, at a time of increasing economic pressures, is the time to help Chris and Lisa. They have put in so many years of work into these twin operations and we can pay them back by contributing to what they call the 3% solution. Sign up for our new monthly donor program, or just give us a one-time gift to say thank you for the photos and stories. If 1,200 people (3.3% of our 40,000 monthly users + event participants & online visitors) give $10/month, we can keep this resource going AND expanding. Categories: Uncategorized | Tags: donate, events, foundsf, history, shapingsf | Permalink. Our 2-Day Sale is now live!! Save 40% on all books on Wednesday, May 21st and Thursday, May 22nd. Browse thousands of titles and use discount code 14W8436 at checkout to receive the discount. Online only. The fine print: *Discount cannot be applied to Sam Francis: Catalogue Raisonné of Canvas and Panel Paintings, 1946–1994 or e-books. Discount not applicable for customers in East Asia. Discount is taken from original list price. Standard shipping rates apply. This offer is not applicable to previous orders, nor can it be combined with any other promotional offers. Promotion codes are applicable only on www.ucpress.edu. California Studies Colleagues: If you were inspired by the interdisciplinary approach of our California on Fire conference in April, please share this announcement with those who may be interested in a similar approach to learning and understanding the challenges facing California. 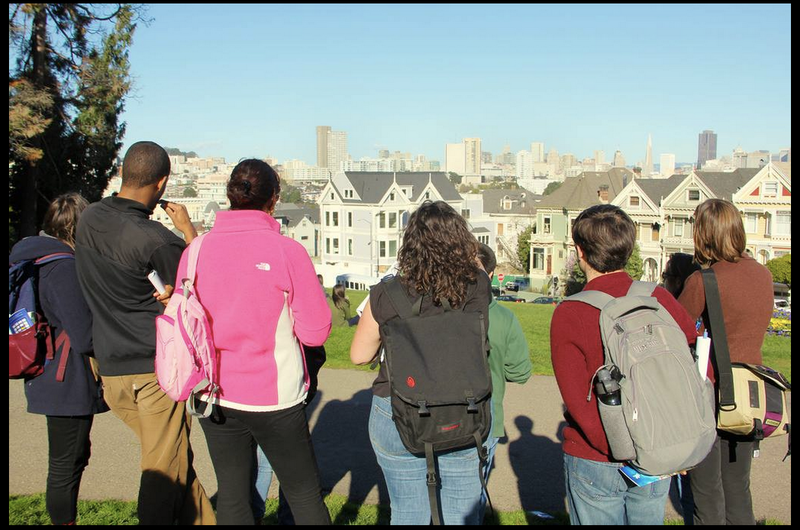 Greetings: We have room for just a few more fantastic students to join the Fall 2014 cohort of our MA program in Urban Affairs at the University of San Francisco. I’m writing to encourage you to share this email with aspiring urbanists who may be interested in diving in for further studies, now or in the future. This is an interdisciplinary two-year program, with a strong emphasis on community-based research in the San Francisco Bay Area. The program combines rigorous academics with an internship and applied research. Community-engaged projects will contribute to and benefit from the vibrancy of the San Francisco Bay Area, while encouraging students to reflect on their role as global urban citizens. Please follow this link to our website for more information. And please encourage students to write me with any questions they may have (rbrahinsky (at) usfca.edu. We will continue to review applications on a rolling basis until the cohort is full. Thanks so much for spreading the word! Categories: Uncategorized | Tags: Graduate Program in Urban Affairs, MA, USF, USFCA | Permalink.